UPDATE: After switching to a larger sensor, I had to switch from the Raspberry Pi3 to a Rock64 for better reliability. You may want to just start with the Rock64. I have recently switched my entire telescope setup over to the open free development platform known as INDI. It runs in concert with another piece of software called Kstars which interfaces your equipment using a module in Kstars called Ekos. These instructions only cover getting this working between a RP3 and a PC. I don't own a MAC computer - sorry. 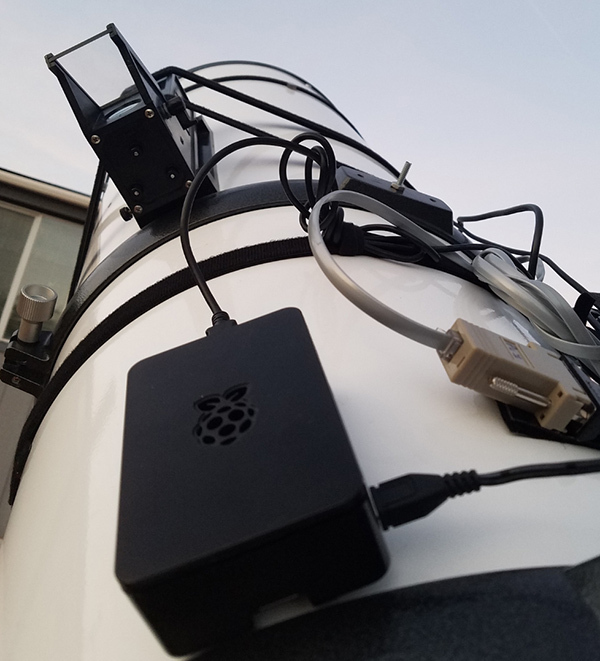 This is a great setup because you run everything over Wifi with no cables connecting your telescope equipment to your PC. So you can run everything from a distance inside of a nice warm place. The Kstars / Ekos / INDI combo supports a lot of equipment - I recommend reading up on what it can do. So basically the Raspberry Pi3 (RP3) turns into an equipment server. All of the drivers for the equipment are hosted in Ubuntu Mate on the RP3 and you are just sending commands to them over your home Wifi network and getting real-time feedback inside of Kstars. - Highly recommended to use a powered USB hub of some kind so equipment is not taking power from the RP3. - First, it is a good idea to get the RP3's heat sinks installed. Simple operation as they come with adhesive heat paste. - After the download is complete to your PC, use the program Etcher to write the image to the SD card you purchased above. This is a very simple 3 step operation, can't mess it up. - Once the image is flashed to the Micro SD card, insert it into the RP3, hookup a Monitor / Mouse / Keyboard, and plug the power in. You should enter the Ubuntu Mate OS. Follow whatever steps are necessary to get into the OS. - Connect to your home Wifi. Choose a static IP for the RP3. You can set it in the Ubuntu OS or look up the documentation on your home Router to setup an IP reservation by Mac address. I am using 192.168.1.5. Keep the static IP as you will need it later to connect to the RP3 from Ekos. - We are now ready to install stuff. - First install INDI. This is done with the Terminal program in Ubunutu Mate. Very easy to find as a shortcut should have been made on the taskbar. It is a command line interface. - By default, commands entered in Terminal are not ran at the highest elevated privileges in the OS. 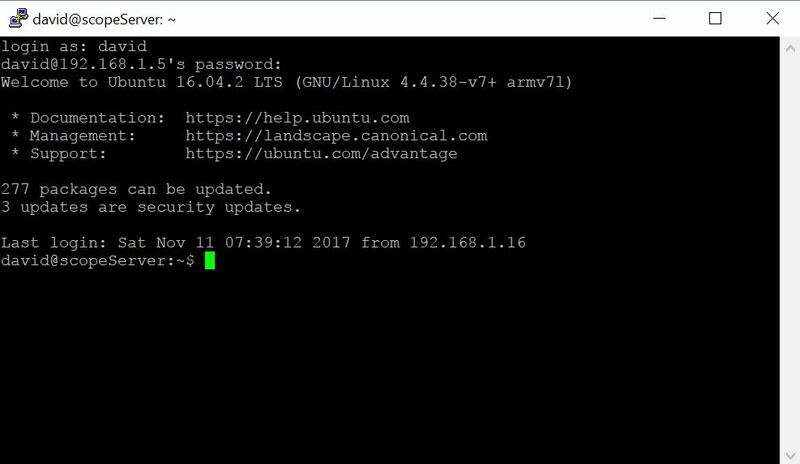 You will add the word sudo before any command you need to run with admin rights. Get familiar with some basic Ubuntu/Linux commands 10 basic commands. - After these are all done, you should have INDI installed on your system. - Once you have the RP3 with the OS installed, a static IP, and INDI installed, you really don't need a monitor / keyboard / mouse anymore. From here we will be connecting to the PR3 over the Wifi network using Putty. - Putty is a program that lets you access the Terminal we used earlier remotely from a PC. It is simple to use / configure. Just put in the IP of the RP3, give it a name, and save it for later use. To connect, just double click on the name. Once you connect, you are prompted for a username and password you setup during the OS setup earlier. - With the RP3 on, to get INDI server going you'd typically run a command like this: indiserver -v indi_atik_ccd (other equipment)... BUT, there is a much easier way to do this with a GUI. Install INDI Web Manager. - INDI Web is a python program that gives you access to the INDI server with a GUI and makes selecting equipment and starting the server much easier. - Get familiar with this page and setup your equipment profile - start the server. - Record the outgoing port number which you will use to connect to the RP3 from Ekos. 7624 is default and should be fine. - Kstars is the planetarium you will use to navigate the sky ect. Ekos is the interface inside of Kstars for connecting to your equipment and shooting images. - Not much I can do to help with Kstars, just need to play with it a lot to get familiar with the interface and options. It is like most other planetarium software packages. 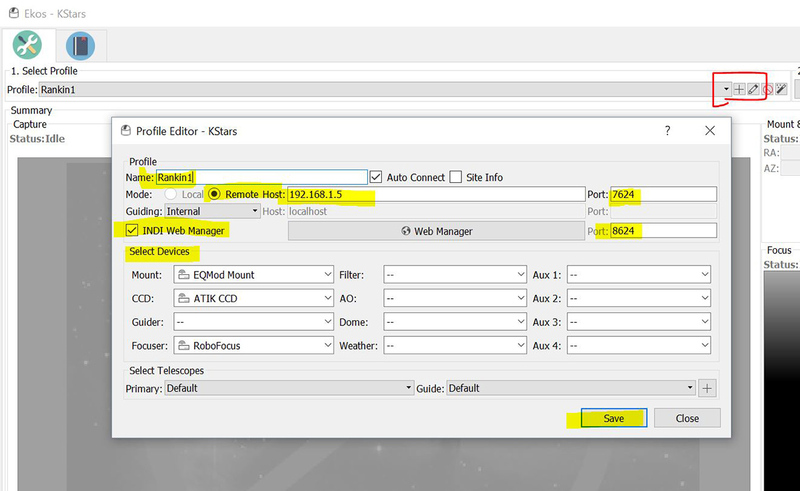 - Once Kstars is all setup for your location, you can launch Ekos from the tools menu. You will get another separate window with some configuration options. - Make sure indi-web is running on the RP3. After you configure Ekos, you can click "Start INDI" then "Connect". This will present the driver setups for each of your attached devices. Go over all of these settings carefully to ensure they are to your liking. - From here, you have full access of your equipment in Ekos. You can plate solve, autoguide, schedule, image, ect ect. - From EKOS equipment profile choose "Start INDI" then "Connect" to get your equipment connected. This may seem like a lot of work, but it has proven to be more than worth the effort. It is very reliable and the ability to run everything wireless from in the house is amazing. Feel free to post questions in the comments below. I'll help out where I can.